Conclusion: The bevy of economic data out of Asia over the last 48 hours is both supportive of the bullish rally in many Asian equity markets and the relative underperformance of Japanese equities. What remains to be seen, however, is where do Asian equities go from here? There has been a slew of economic data coming out of Asia over the last 48 hours – some good, some bad, and some ugly. Rather than belabor the point(s) with excessive prose, we’ll just highlight the meaningful deltas and inflection points in the call-outs and charts below. 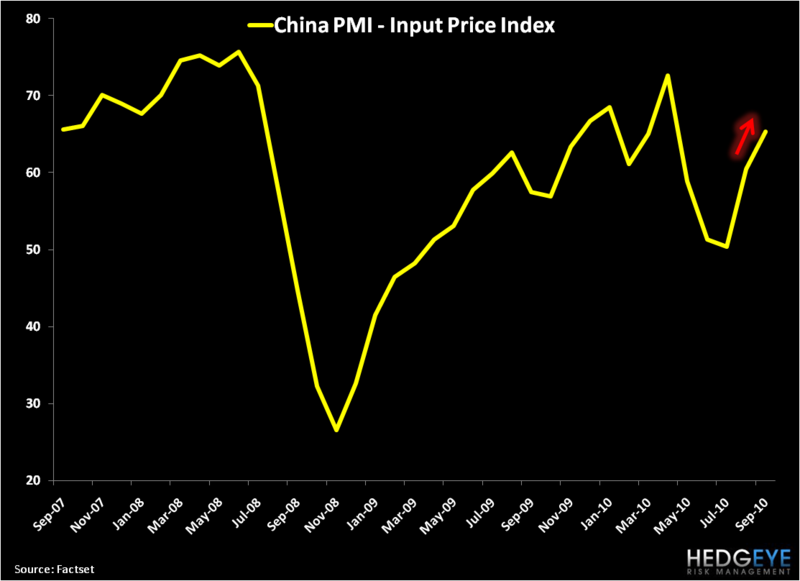 China PMI accelerated in September to 53.8 from 51.7 in August. Indexes of output, New Orders, and Export Orders all climbed MoM as well. Japan Tankan Survey of Business Conditions improved in September. Large Manufacturer sentiment rose sequentially in 3Q10 to 8 from 1 in 2Q10 and Large Non-Manufacturer sentiment improved QoQ to 2 from (-5) in 2Q10. Sentiment hasn’t been this high since 1Q08 and 2Q08, respectively. Japan Unemployment ticked down 10bps in August to 5.1%. Japan PCE accelerated in August to +1.7% YoY from +1.1% YoY in July. 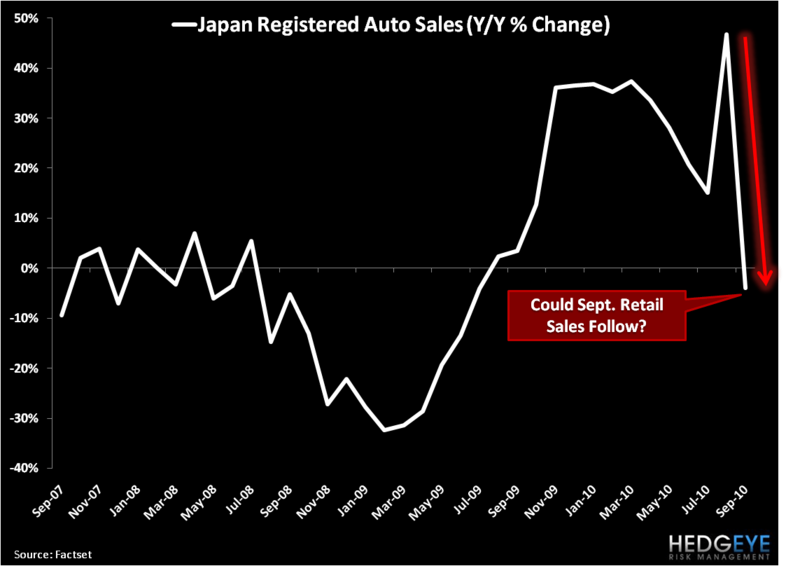 Japan Retail Sales accelerated in August to +4.3% YoY from +3.9% YoY in July. Korean Industrial Production accelerated in August to +17.1% YoY from +15.5% YoY in July. India Exports accelerated in August to +22.5% YoY from +13.2% YoY in July. Thailand CPI decelerated in September to +3% YoY from +3.3% YoY in August. Thailand Exports accelerated in August to +23.6% YoY from +21.2% YoY in July. Indonesia CPI pulled back in September to +5.8% YoY from +6.4% YoY in August. Taiwan raised its benchmark policy rate to 1.5% from the prior 1.375%. China stepped up efforts to cool its property market. The latest batch of measures include a ban on extending loans to buyers of third homes, extending a 30% down payment requirement to all first-home buyers, and a withdrawal of an income tax exemption on profits from the sale of real estate reinvested within one year. China may elect to announce property taxes to residential properties should they feel the latest round of tightening is not effective. Japanese consumption head fake? The sequential uptick in August retail sales was supported by last-minute demand for cars ahead of the expiration of a government incentive program, as well as purchases of air conditioners during the nation’s hottest summer in over a century. 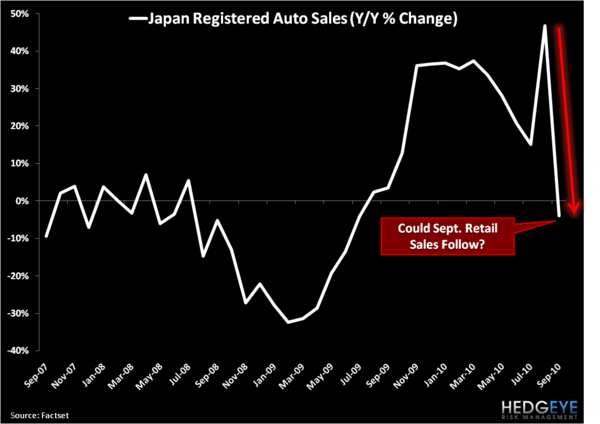 In a sign that these tailwinds are wearing off, Japan Registered Auto Sales rolled over in September to (-4.1%) YoY from +46.7% YoY in August. Further, Large Retailer Sales ticked down in August to (-1.9%) YoY from (-1.2%) YoY in July. The strength in the Japanese unemployment release is also to be taken with a grain of salt, as over 90,000 Japanese citizens dropped out of the labor force in August due to their inability to find jobs. Japan CPI came in flat for September, staying at (-0.9%) YoY. Deflation continues. Japan’s strong yen woes continue: Nintendo, the world’s largest maker of video-game consoles, recently cut its profit forecast by 55%; Murata Manufacturing Co., the maker of a third of the world’s ceramic capacitors (devices used in flat-panel TVs and smart phones) has planned to lay off 3,000 of its 4,500 contract employees and to move production abroad with the goal of 30% overseas production by 2012. Further, the 3Q Tankan Survey release showed a sharp divergence between the Large Manufacturer 4Q10 sentiment forecast and the 3Q print: (-1) in 4QE vs. +8 in 3QA. Automakers in particular expect an even larger decline in 4Q to (-6) from the current +32 - the widest delta in forward expectations since the Bank of Japan started tracking confidence back in 1992! Japan Industrial Production fell in August to +13.7% YoY from +15.8% YoY in July. On a MoM basis, production fell (-0.3%) from July, which surprised consensus expectations of a +1.1% gain. According to the Survey of Production Forecast in Manufacturing, Industrial Production is expected to decline (-0.1%) and (-2.9%) MoM in September and October, respectively. Shipments deteriorated further in August, falling (-0.5%) MoM vs. the (-0.1%) decline in July. Japan PMI (Nomura) declined in September to 49.5 from 50.1 in August. China’s PMI Input Price Index rose in September to 65.3 from 60.5 in August as raw material costs climbed (think: dollar down; commodities up). South Korea Manufacturer Confidence fell in October to 99 from 104 in September. This is the lowest level in eight months and reflects growing concerns over the confluence of the strong won and a slowdown in W. European and U.S. consumer demand for South Korean goods. Further augmenting this point, Non-Manufacturing Confidence actually increased in October to 86 from 85 in September. South Korea Exports decelerated in September to +17.2% YoY from +29.6% YoY in August. The economic and company data above is both supportive of the bullish rally in many Asian equity markets, as well as the relative underperformance in Japanese equities. What remains to be seen, however, is where we go from here? 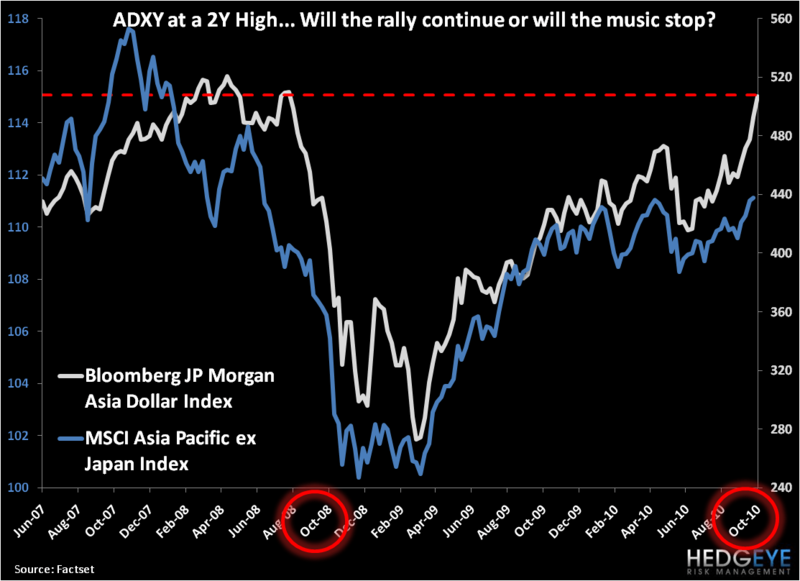 With U.S. consumer demand prepared to tank in 4Q10 and 1Q11, Western European consumer demand potentially following suit, and the prospect for further strengthening in Asian currencies (Asia Dollar Index at a two-year high), do Asian equities continue to go straight up given the likelihood of sequentially deteriorating economic data over the next 3-6 months? 40-50% of intra-regional trade within Asia is basic and intermediate goods meant for re-export outside of the region. Given Asia’s leverage to a weakening U.S. and European consumer, we must ask ourselves whether Asian equities could correct meaningfully in the next 3-6 months based on the confluence of declining trade and equity market mean reversion. 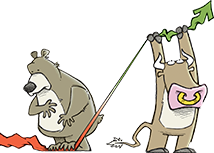 While we are not yet ready to make a call in either direction, we’d be remiss not to call out the downside risks. Lastly, as we see from the aforementioned China and S. Korea inflation data, Mr. Bernanke’s quantitative easing experiment continues to export commodity price inflation to the rest of the world, as dollar debasement results in appreciation of assets priced in dollars. No reason to make it any more complicated than that. As always, time, data and more prices will guide our decision-making from here. CHART OF THE DAY: Deflation?